Valuable Coupons & Free Maps Inside! WE L COME T O W I NT ER AT LA K E TA H O E ! – boasting one of the world’s largest concentrations of winter resorts. The Lake Tahoe area is home to over 15 alpine resorts, numerous cross country centers, snowmobiling, ice skating, snowtubing, and a host of other fun wintertime activities for all ages. Lodging options abound with choices for all budgets, ski-in/ski-out, lakefront, or in town. Choose from 4-star resort hotels and exciting resort villages, to casinos, motels, condominiums, cabins and mountain homes. Off the slopes the fun never stops with a huge variety of dining, shopping, entertainment and nightlife, including world-class casino gaming, lively nightspots and music venues, local watering holes, and a vast selection of superb restaurants, from lakefront to mountain top, to satisfy all palates. All of this activity surrounds beautiful Lake Tahoe, North America’s largest alpine lake and a natural and scenic wonder. Straddling the California/Nevada state line at just over 6,000’ above sea level, the lake’s cobalt blue waters reflect the clear blue Sierra skies on over 300 days of sunshine each year. Abundant snowfall comes from recurring storms rolling in off the Pacific, carrying southern moisture and mixing with Arctic air. The result is an average of over 33 feet (396 inches) of snowfall per year, exceptional conditions, and a glorious extended season, lasting through late April and beyond. PUBLISHER: Certified Folder Display Service, Inc.,1120 Joshua Way, Vista, CA 92081 • (760) 727-5100 Fax: (760) 727-1583 certifiedfolder.com REGIONAL SALES OFFICE: Ski Lake Tahoe, 919 Incline Way, Unit 25, Incline Village, NV 89450 • (775) 832-2002 Fax: (775) 832-5153 visitortips.com/tig/skitahoe Neither Certified Folder Display Service, Inc. or Ski Lake Tahoe make any representation expressly or implied as to the performance of the advertisers herein, or the accuracy of the facts herein. 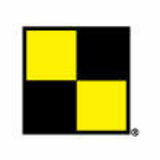 Certified Folder Display Service, Inc. and Ski Lake Tahoe jointly and severally disclaim any responsibility for acts or omissions of these advertisers. Copyright 2018 by Certified Folder Display Service, Inc. All rights reserved. No part of this Travel Guide may be reproduced without permission of the publisher. SLT1118. 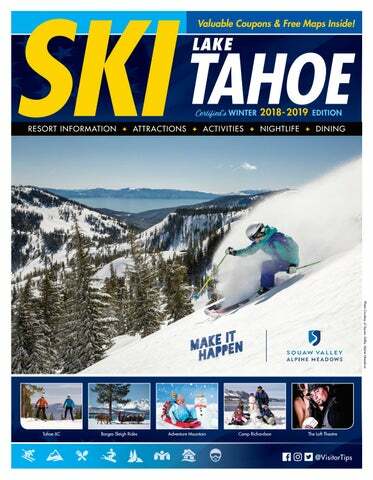 SKI TAHOE is your complete guide to winter fun at Lake Tahoe. Our maps and directory listings will provide you with quick and easy information to help you plan and enjoy your trip, and our advertisers offer a variety of choices and valuable coupons for activities, lodging, equipment rental, shopping, and more. Keep your copy close by as you explore all that Lake Tahoe has to offer. When you return next summer, be sure to pick up a copy of 101 Fun Things to do in Lake Tahoe! Bus service provided to Park & Ride lots between 7am–7pm. Visit our website for valid dates and details. FREE Night Service until 2am! SKI & SNOWBOARD RENTALS Annually Voted BEST Rental Shop in North Lake Tahoe & Truckee! Book rentals online OR present this coupon at any location % your ski, board & SAVE up to OFF * snowshoe rentals! www.TahoeDaves.com *Online bookings must be made 2 days in advance. Not to be used with other promotions and/or discounts. CALL FOR TIMES & LOCATIONS AVAILABLE. Granlibakken Resort Site of “Olympic Hill” built Known as Lake Tahoe’s Oldest Ski Resort. Go to VisitCWC.com for FREE visitor information, maps and discount coupons! California Welcome Centers are California’s Official State Visitor Centers offering valuable information and services for today’s traveler. Simplify your travel plans and enhance your visit with assistance and support from the experts at any one of our convenient Welcome Centers located throughout the Golden State. Hope to see you soon! KINGS BEACH 267 & NORTHSTAR r St .
Lake Tahoe never freezes over due to the constant mass movement of water from the bottom to the top. In February of 1989, Emerald Bay froze over for the first time since 1952. Rubicon Point - Deepest shoreline on the lake drops 1400’. Once a fishing camp of the Washoe Indians. Cave Rock is still considered today a sacred site to the Washoe Indians whose ancestors spent their summers at Lake Tahoe and once performed religious ceremonies inside the largest of the caves. Phipps Cabin. Home of old Indian fighter General W. Phipps. Magnificent Ehrman Mansion - built in 1901-1903. Open for summer tours. The 169 foot steamer “SS Tahoe,” the “Queen of the Lake” was launched in 1896 and scuttled here in 1940 in 350’ of water. On average 1,400,000 tons of water evaporates from the surface of Lake Tahoe every 24 hours, yet this drops the lake level only one-tenth-ofan-inch. The total evaporation averages more per day then the water released through the Truckee River Dam outlet. The biathlon and cross-country events for the VIII Winter Olympics in 1960 were held at what is now Ed Z’Berg Sugar Pine Point State Park. Original Dam built here in 1870 at mouth of Tahoe’s only outlet. Gatekeeper’s Cabin now houses museum. Millionaire George Whittell once owned more of the Tahoe Basin than any other person-his fabulous Thunderbird Lodge was headquarters to an empire stretching from Crystal Bay to Zephyr Cove. As an “Interstate Navigable Waterway” Lake Tahoe is protected by the US Coast Guard. Lake Tahoe is the highest altitude lake of its size in the USA, and the second deepest, behind Crater Lake, Oregon. Squaw Valley opened in 1949 and was the site of the 8th Olympic Winter Games held in February, 1960. Camp of the infamous Donner Party, trapped here in the savage winter of 1846/47. Donner Memorial State Park and Emigrant Trail Museum. Look for the coupons and valuable offers from these businesses! Receive 10% off 1 full hour of bowling. Offer good only with coupon. Only 1 coupon per customer or group per day. Not valid with other discounts and promotions. Not valid with reservations. Not valid on holidays. Offer subject to change without notice. Welome to a cozy getaway between the lake & sky.